As you may have known, Java have strong support for Network programming. You can deal with lower level protocols like TCP/UDP or higher level protocol like HTTP. In this series of articles, I will only cover Java API for HTTP protocol. As usual, I will start with my favourite part first. HTTP is a protocol on top of TCP. It means that it is perfectly possible to use Java API for TCP (socket programming) to implement HTTP server. However, no one do that unless for study purpose or have too much time to burn. Using higher level API definitely makes coding simpler and much faster. Still, if you need to deal with some other protocols without built-in support like FTP, you will need to use low level API to implement your application. From Java 1.2, Java is split into 3 versions, J2SE, J2ME and J2EE, each version serve a special purpose. The J2SE is the core of Java, it can be used to develop desktop application. J2ME is the special library to develop mobile application. J2ME is already extinct by now. J2EE, our main focus today is the library to build web application. When you choose to download Java to your system, the package will always have JRE runtime included. It is J2SE. J2EE is a set of API and standards rather than concrete implementation. Most of its contents are interface rather than class. If a server was built with the implementation of all J2EE APIs, it is a compliant J2EE application server. Up to today, the border between J2EE and J2SE is not so clear any more. For example, the default J2SE package already include JDBC and JNDI interfaces. You can see them in the rt.jar file (run time library). For other APIs of J2EE, you need to include them in the class path to use. HTTP is a stateless protocol. It means the server generally do not remember who you are and what have you done. However, it is critical to have this feature if you implement authorization or due to business requirements. To achieve that, normally container will include a session cookie to the first response. That help container to identify user and create server side session. The session cookie for Java normally have the name JSESSIONID. To avoid space issue, the container will delete the server-side session if there is no request up to a certain amount of time. If this happen, the session cookie is not recognized any more and server will assign a new session cookie and session object. HttpServlet is not part of core Java. Hence, to do servlet programming, you need to include Servlet API to the project classpath. The most common way is to include the server runtime to your project. Any Java server should have ServletAPI implementation and API. If you do not want your project classpath to have any server runtime, you can manually include ServletAPI to classpath. As mentioned above, J2EE was born with the goal of providing common interface for various vendor implementation. That why ServletAPI has nothing but a few interfaces, XML schema and some specific requirements. Servlet API started from version 2.2, gradually upgraded to 2.3, 2.4. 2.5 and totally revamped in version 3.0. 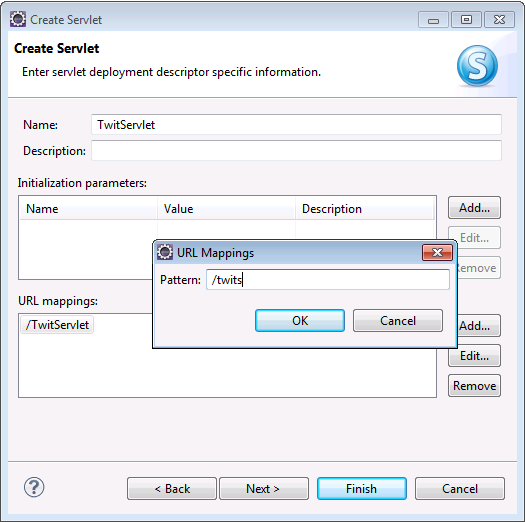 Servlet is a very primitive API, that why it is not so convenient to use. Rarely you see anyone using Servlet to render webpage unless the application is super simple. Any developers working with JavaEE should be familiar with framework build on top of ServletAPI like SpringMVC, Strut or JSF. After getting tired with using OutputStream to render html content, JSP was introduced as Java version of Php script. Jsp makes creating html content is much simple to write. However, as Java is not dynamic language, Jsp file is converted to Servlet before serving first customer. Slowly, as Java world slowly adopt Ajax and RestAPI, contents is often delivered with Json format and server-side rendered HTML is used less often. You can Google and download servlet-api-2.5.jar to take a look at the content of the API. The jar file include 3 packages javax.servlet, javax.servlet.http, javax.servlet.resources. In the scope of single article, I will cover major interfaces that developer usually used to develop web application. The two most important interfaces to handle HTTP request are Servlet and Filter. As the HTTP request come to web container from internet, the container generate a ServletRequest or HttpRequest object that contain the information of the request. Later, it use the returned object of type ServletResponse or HttpServletResponse to render HTTP response. In the above example, the container suppose to generate HttpServletRequest because we use HttpServlet as handler. The main motivation of splitting Filter and Servlet as to have Servlet focusing on business logic and Filter to handle general concerns like logging, or security. HttpServlet include support for all HTTP method GET, POST, HEAD, PUT and DELETE. However, most people only implement GET and POST requests. This is surprise though because HTML 4.0 and XHTML 1.0 only support GET and POST (which mean you can not send other kinds of requests in old browsers like IE7). Container use single instance to serve all request to the same URL, that why you need to ensure ThreadSafe when implementing Servlet. The Servlet API give you HttpServletRequest and HttpSession, both are method parameters and thread safe. If you choose to have other field variables, it is a must that these variables are thread safe as well. Container make use of HTTP thread pools to serve request. If the container running out of threads, it will hold the requests waiting for the first available thread from the Thread pool. For example, the maximum amount of HTTP thread for Tomcat is 200 and we know that Tomcat can serve up to 200 concurrent requests. As of Servlet API 2.5, the HTTP thread pool is fully occupied until the servlet and filter complete processing. Even if the thread sleeps, waiting for some resources, it is still not available for other request. Hence, if you let the Http Thread hang up, you effectively reduce the throughput of system. Deployment Descriptor is the fancy name for web.xml. Any Java web application must always have this file WEB-INF/web.xml. The container look for this file to know how load webapp. There are two other optional folders, WEB-INF/lib and WEB-INF/classes. Any jar files drop to WEB-INF/lib will be included to webapp classpath. 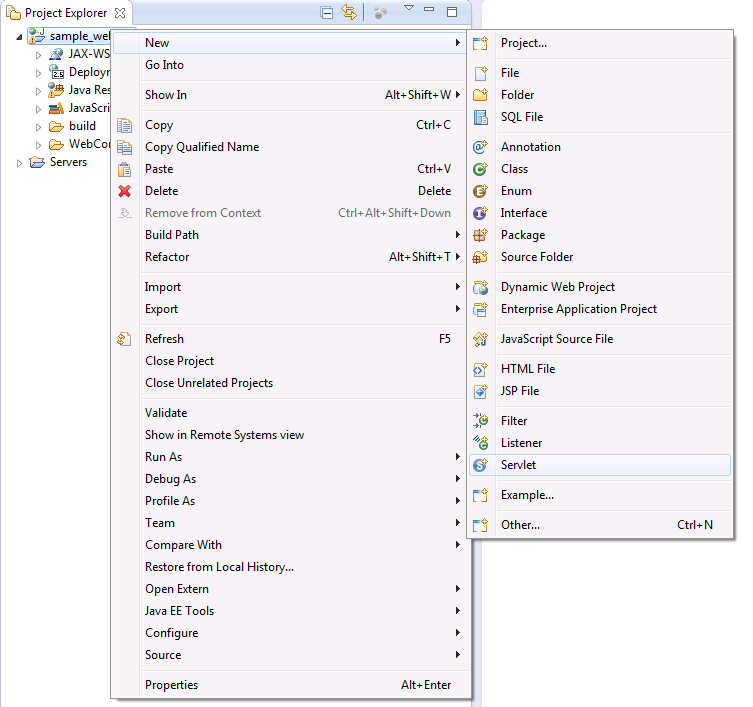 Project source code and resources will be compiled and drop inside WEB-INF/classes folder. Hence, if you are worry about deployment process, here is the place to check. Normally, a standard deployment descriptor will contain important information like declarations of filter, servlet, welcome files, context listener, error pages, security constraints, context param... It is essential that you know about all of these concepts very well as they are the fundamentals for building java web application. In the above example, request.getPathInfo return "/" for the first URL and return null object for second url but for my application, both URLs should be identical. So, this line of code is simply boilerplate code that I need to add in just to cope with limit of API. Another well-known limit is the ability to read request parameters and request body. Because of this, it is very soon that developers start building framework on top of Servlet API to cope with this limit. All the MVC framework deviate from Servelt API by letting a single servlet serve all requests for all URL. This servlet will invoke some services to serve the request. By the time I graduated, the most popular framework in the market is Struts. It create mapper concept. 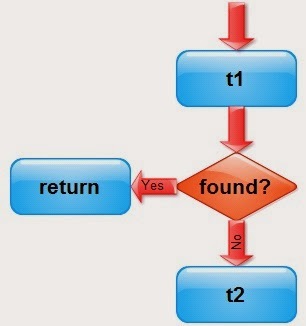 This mapper will automatically map request paramter to Form object, which is a Java bean. In the service's methods, the form was included as parameter to use. This is a pretty cool idea. The Spring MVC even simplify things further by letting you choose any method parameter name and type. It will try to match the method parameter with any request parameter and automatically assign value. If the request parameter is different, you can override the mapping with annotation. I would not want to spend too much time talking about Git’s history. (if you are interested, you can always readwikipedia. If you are like myself, who was previously using CVS/SVN or Clearcase/Perforce to manage your software, I hope this article would improve your understanding on how Git works and how it could increase your productivity as well. As the name suggests, a DVCS does not require a centralised server to be present for you to use it. It’s perfectly fine to use Git as a way to store a history of your changes in your local system and it’s able to do so efficiently and conveniently. However, as with all Software management tools, one of the main benefits is to be able to collaborate effectively in a team and manage changes made to a software repository. So how does Git (or any DVCS) allow you to work in a standalone manner and yet allow you to collaborate on the same codebase? So that being said, how do I actually share my code with the rest of my team ? The wonderful thing about Git is that it allows you to define your workflow. 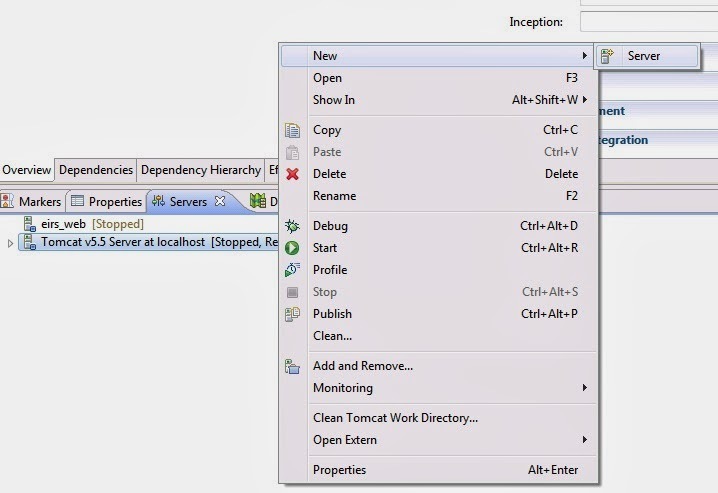 Do you want to synchronize your code directly with your peers? Or would you prefer a traditional “centralized” model where everyone will update the “centralized” server with their code. The most common way is the latter where each developer or local workstation will synchronized their codebases with this centralized repository. This centralized repo is also the authoritative copy of the repository which all workstations should clone from and update to. So, for the centralized model, everyone will perform a “git push” to this central repo which every workstation will nominate as its “origin” for this software repo. Before a “git push” succeeds, git will need to ensure that no one else has actually modified the base copy that you have retrieved from this centralised server. Otherwise, Git will require that you perform a “git pull” to merge the changes performed by others into your local server (which might sometimes result in a conflicted state if someone changes the same files you have). Only after this is done will you be allowed to push the new merged commit to the server. So what if it’s DVCS? When you use Git in your software development, you will start to realize that making experimental code changes is not as painful as it used to be with other tools. And the main reason for that would be the ability to do a “git stash” whenever you want to .. or a “git branch”, which as the name implies, creates a new branch off your current working code. Branching in Git is an extremely cheap operation and it allows you to define an experimental branch almost instantaneously without having to explain yourself to all your team mates who are working on the same code base. This is because you choose what you want to push to the “centralized” Git repo. Also, whenever you need to checkout a version of the software from history or remote, you can “git stash” your work into a temporary store in the Git repository and retrieve this stash later when you are done with whatever you need to do with that version. Ever tried creating a branch in Clearcase or Perforce? I shudder even at the thought of doing it. SVN does it better but it is still a rather slow operation which requires plenty of network transfers. Once you have done branching using Git, you will never want to go back to your old VCS tool. Originally, I asked a Scrum Master to help me write something about Scrum. However, he said it may not worth it because there are already too many documents, books out there and whatever he say will not be authentic. Thinking about what he said, may be it will be better if I assume that reader can do their own research on Google to find out more about Scrum and I only do my part of sharing personal experience with it. "Scrum is an iterative and incremental Agile software development framework for managing software projects and product or application development." From my understanding, Agile is a software ware development method that aim to develop software incrementally. The progress will be reviewed regularly and new features will be created based on current situation. Scrum is one well-known Agile methodology that define the practice to do Agile development effectively. The idea behind Agile or Scrum is embracing changes rather than locking requirements. We need to embrace change because it is the reality that we cannot avoid. 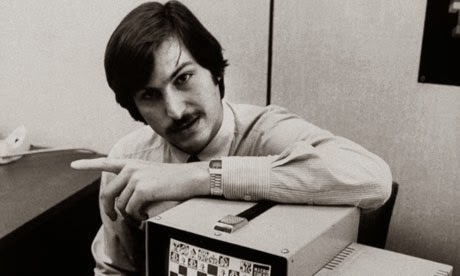 To understand Agile, we should go back to earlier day of software development. There are something special about these earlier days. It is a big mess. Developers of that time did not think the same way as what we think now. Professionalism means writing lost of documents, defining the requirement as precise as possible and spending more time to prepare for implementation before actual implementation. This is what we called Water Fall model. Water Fall is the norm of the industry in the past and it is still popular nowadays. When I took my degree last decade, Water Fall is the only methodology taught in Software Engineering course. Even after I graduated, job titles in the market reflect Water Fall model with Project Manager, Analyst, Designer and Programmer roles. Water Fall bases on the assumption that if we spend a lot of time thinking, preparing, analysing, we can do it right when we need to do it. Theoretically, this idea is quite cool. Practically, it is still popular in Asia, especially in the conservative industry like banking and finance. interact with customer, he/she must be analyst or designer and at most, architect. 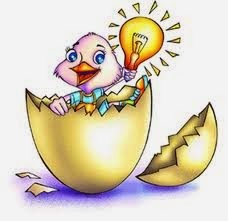 As most of us know, good ideas does not necessarily be applied successfully in real life situation. What had happened is the high rate of failure in software industry. There are many kind of failures like failing to deliver, budget overshoot or less serious, delivering a software that no one interested. However, for anyone that stay in the industry for a decade, it should not be a big surprise. 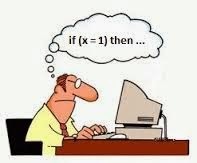 Here are some common issues why it is so hard to develop software the right way. 1. Pushing does not work well in Software Industry. Unlike factory, software development requires developer to spend effort and good will to deliver high quality product. There is no machine that can write code yet. 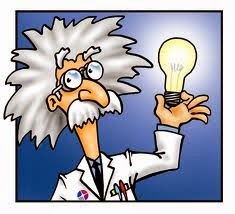 The only source is still human brain and it does not work very well if it reside in the head of an unhappy person. 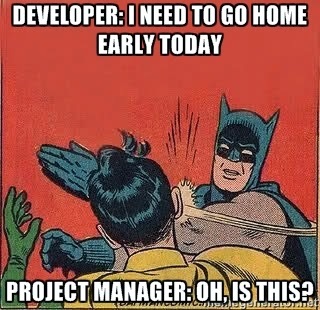 But it is unfair if we blame it all to the Project manager. Deadline and schedule are decided by people who does not involve very closely to development and sometimes, by business requirement. You must be very lucky if got chance to work in the environment that do not OT (over time). Locking requirement is good. It help to put the blame to someone else, not us, for producing crappy software that no one want to use. Still, I feel pity for our customers. It is incredibly difficult to know what they really need before they start using it. But unfortunately, no one let them do that and they continue to produce all kinds of nonsense and unrealistic requirement. To be fair, analyst help them to create the mess too. 3. How people react to failure. Ancient wisdom say if you do not do it right, you may not prepare well enough. So, what a smart person will do? He spend more time preparing or if we say another way, less time doing. Unfortunately, by doing that, problem is getting more and more severe. So, what is the real problem here and how should we solve it? personal experience of playing paint ball not too long ago. To summarize, it is a disaster. To elaborate further, I feel it is hard to hide and shoot a person at the same time. After enjoying hitting tons of bullet on my, the pro told me that I shoot the wrong way. 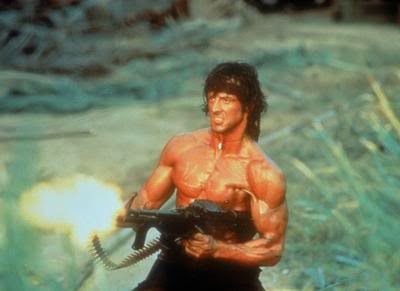 They say do not shoot single bullet or waste all your bullets to look like Rambo. The key point is to shoot 2 bullets at one shot. Why? Because the bullet fly fast and you need 2 bullets to have enough time to see where the bullets landed. Base on that information, you adjust gun direction and aim a more precise shoot. That is the point, you shoot first, got initial feedback and improve from there. This is how things should be done in software development. You build something first, see how it look and slowly improve on it. Creating wonderful application is not easier than learning how to ride bicycle. The best approach is to sit on it, ride it, fall down, stand up and sit on it again. For the sake of projects and for the people, do not lock project requirements, constantly review what you have build and add new requirement is the formula to success. To constantly review progress and define new work, Scrum team divide project schedule into iterations. Commonly, the iteration length is two weeks. It is the sweet spot because if it is less than 2 weeks, the overhead of management is too high, if longer, then the team cannot adapt to change fast enough. Beginning of each iteration, the team spend time to do iteration planning. Iteration planning normally include tasking, estimation of stories that being scheduled to the current iteration. This is the fun part where we play Poker style estimation game. Each developer will have a stack of cards, each card include the estimated effort for a story. 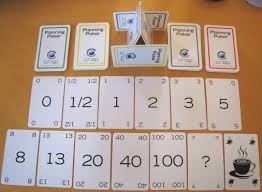 Due to someone's brilliant idea, the number in the card is not random, they follow Fibonacci number. For each story, developer show cards at the same time to voice out their idea of how much effort is needed for the story. After debating and voting, the team commit to the story with the estimated effort. Responsible team even plan work for iteration ahead. It cannot be too far and too precise but it help us to have a quick view of what is going on. They called it T+1 or T+2 planning (means 1 or 2 iterations ahead). Daily stand-up makes sense when the team size is small enough and people know what other people are doing. It is better to time-box it (normally 15 mins). Retrospective meeting normally happen at the end of iteration. It is less important, hence, many teams choose to skip it or do it less often. Still, retrospective play a great role of generating insight and discussing how to improve performance. There are many ways to do retrospective but you need to stay to its objective, that is to discuss what had happened in last iteration and suggest solutions to overcome issues. Backlog is for the Product Owner to express what he want to achieve. Basically, it is a collection of user stories. Developers help to estimate each story, note down the dependencies among stories. After that, it is Product Owner role to plan in stories for next iteration from backlog. It should fit team capacity nicely. Normally, the life in Scrum team is pretty balanced, no rush, no last minute surprise and no cutting corner to deliver work. It is true that due to business requirement, product need to be launched on time but constantly review progress give product owner early information and more space to manoeuvre when facing blocker. It is also helps to build better product due to quick feedback and helps to create a more realistic schedule. I am the guy who believe more in human more than process but if the process is wrong, life is more painful than it should be. So, for the sake of developer world, spread out the ideas so that we suffer less and the quality of software can be improved. On the second day, the objective is to create and deploy a simple web project. There is not much explanation in the first few articles, just to let learner get used to the popular tools for developing software. As the tutorial progress, learner will get to know faster way of getting things done and more understanding of how things done. 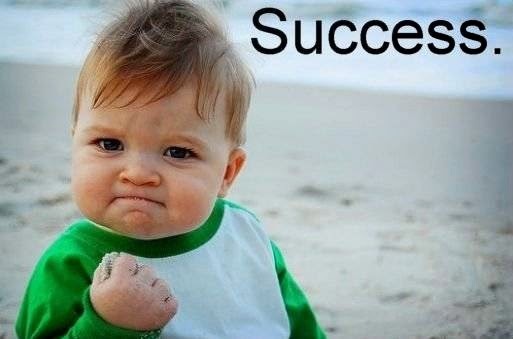 Completed Java Tutorial Part 1. Provide that you have downloaded the proper version of Eclipse, start it up, you should have the right tool to develop web project. The screen is normally divided like above, the left is for project explorer, middle for editor, right for Outline and bottom for Console and other miscellaneous views. The usage is quite natural, select a file on the explorer, edit it on editor and view result in Console. Each box you see is one View. The layout of Views is called Perspective. On the top right corner of the screen, you should be able to see some default perspectives like JavaEE, Java. 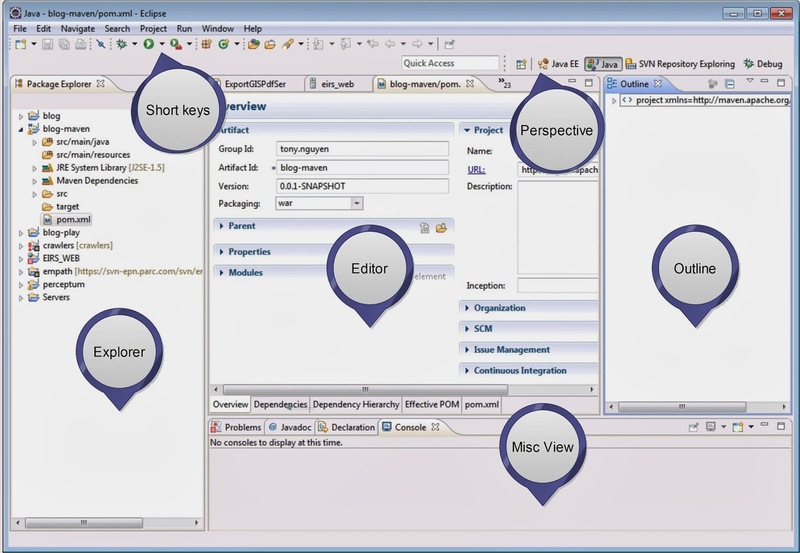 Choosing the right Perspective can make Eclipse temporarily customized to your need. For example, if you compare Java and JavaEE perspectives, Java Perspective gives you short keys to create new class, interface. Clicking on New button show menu with creating new Class, Interface, Package,... 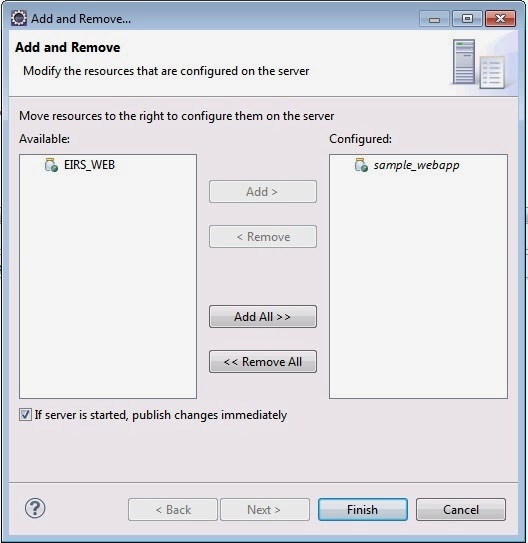 In contrast, Java EE New button show menu with creating Servlet, Dynamic Web Project,... It also automatically include Server view at the bottom. Depend on your need, you will need to switch over among different perspectives. If you are not happy with current Perspective, select Window -> Show View to add whatever View you need to the existing Perspective. The view also can be dragged and drop to any portion of screen. In the earlier tutorial, we unpacked Eclipse to "java/jdk1.7.0_51". Let Eclipse know this. Select Window -> Preference. 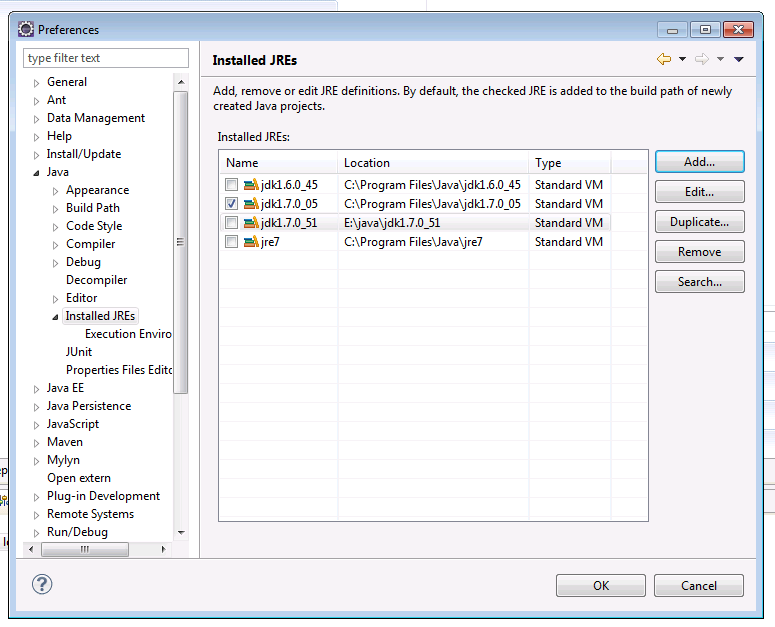 Navigate through the left panel until Java -> Installed JREs. From the screen shot above, I already registered some JREs with my Eclipse. If you follow this tutorial from beginning, you should only have the default jre7 from system. This is not what we want to develop with because the JRE included inside JDK installation give us better support and source code. Therefore, please click on Add, and point the jdk folder to "java/jdk1.7.0_51". Please check the check box to make Eclipse use this JRE as default for future projects. Click on Add to register new Server Run time. 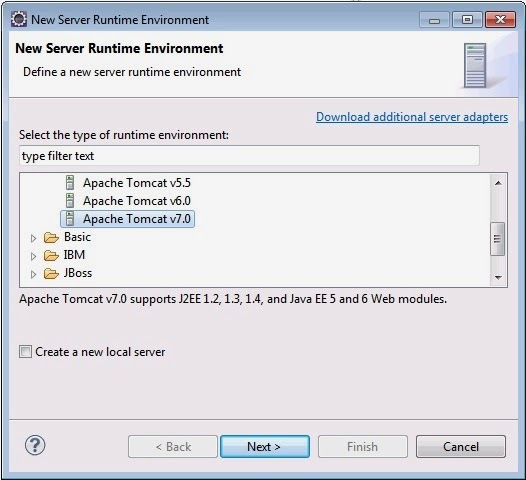 Choose Apache Tomcat 7 runtime. Continue to fill up with the Tomcat and Jdk that we prepared from last tutorial. Too bad, this is just the runtime, not the server itself. Next step is creating new server using this runtime. You can use the New button mentioned above to create new Server but it requires more mouse clicks because New Server is not included in default menu. The faster way is to open Server view, right click to create new Server. Repeat this stupid step of selecting server type again. Please remember to select the server type first, because the Server Runtime Environment combo box only show the Runtime compatible to your server type. Click Finish to end the server creation. We are not going to use any fantastic feature of Servlet API 3.0 yet, so start with module version 2.5 first. Select the target runtime we created earlier and choose any name you like for the webapp. In the picture above, I used Package Explorer to view project, you can see slightly different UI if you use Project Explorer. As we set the runtime as Tomcat 7 when creating project and default JRE is jdk 1.7.0_51, we can see that both libraries are added by default to project. 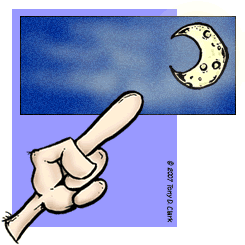 Eclipse store all web web contents inside WebContent folder. We are going to add welcome file index.html for it. Select New -> Web -> HTML File. Choose file name as index.html and put to WebContent folder. Put whatever content you like to the index file, for me, I just simply choose "Hello World"
Let deploy this webapp to Tomcat server. 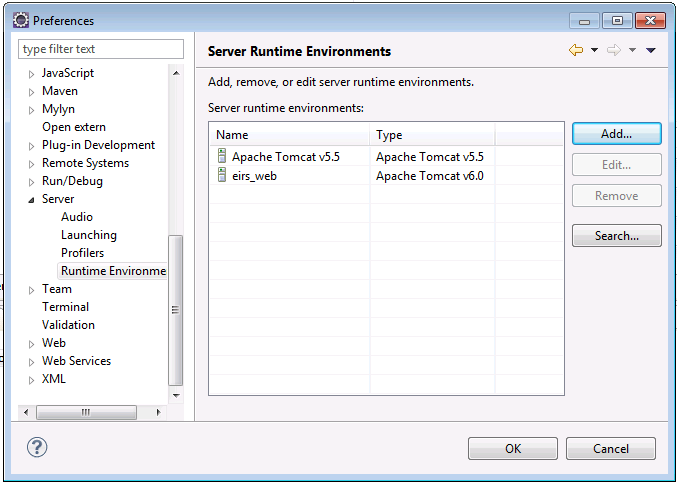 Right click on Tomcat server and choose "Add and Remove ..." webapp. After add the sample_webapp, click finish. 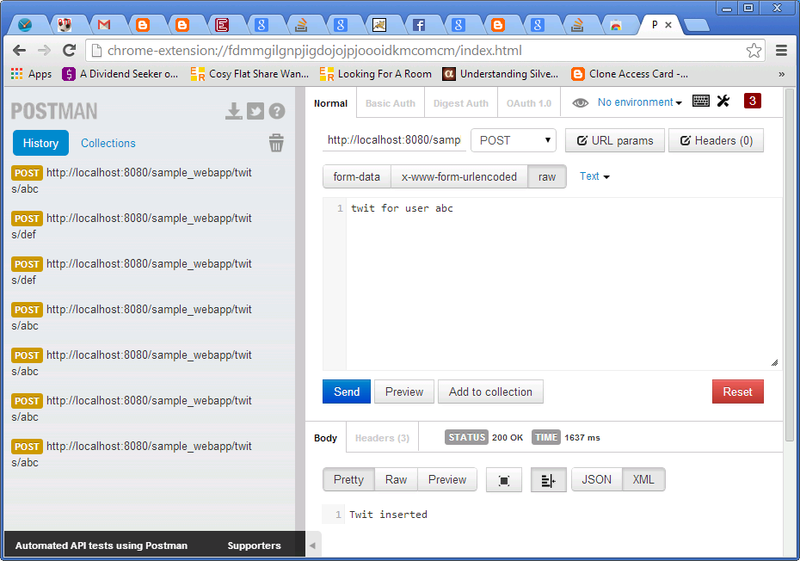 The index.html is the welcome file, it will be served when you do not specify anything after webapp. This article simulate what you will go through in the first day of job. The ultimate goal of the first day is to setup your working environment. Create one folder named "java" to store all your related development stuffs. In my computer, it is E:\java. If you use Linux or Mac, can set it to "~/java"
Download latest jdk version (currently v1.7.0_51). Install it to "java/jdk1.7.0_51". It is advisable to avoid extracting to "C:\Program Files" because this folder name has space. Please remember to keep the jdk version number in folder name because it is likely that we will need to have multiple jdk versions in the future. Add "jdk1.7.0_51\bin" to system path. After this step, open command line and type "java -version" to see if system can find the proper Java environment. Create new system variable JAVA_HOME point to jdk folder that setup in the earlier step. Go to http://maven.apache.org/download.cgi and follow the instructions to install Maven. As above, please do not put Maven in your program files folder. I would recommend to put it in "java\apache-maven-3.2.1". 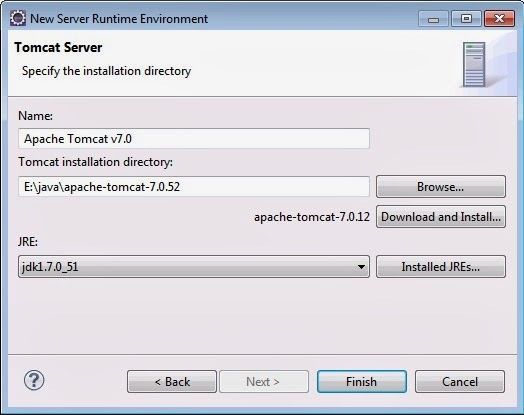 Download Tomcat 7 from http://tomcat.apache.org/download-70.cgi, choose the binary, core package. 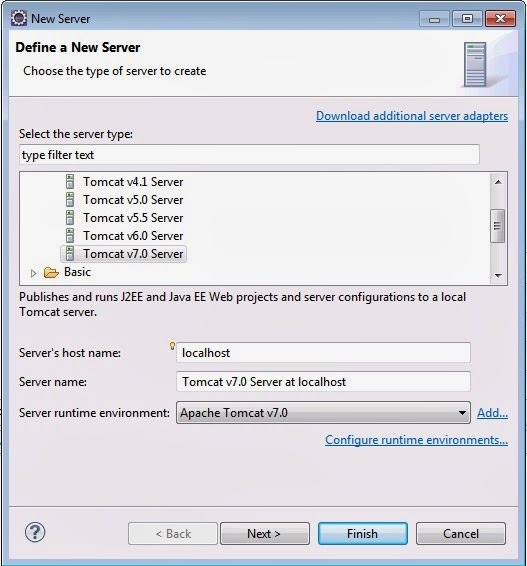 Unpack Tomcat to java folder. There are 3 well-known IDEs and all of them are perfectly fit for java development: Eclipse, Netbean and IntelliJ. If you have never heard about them I would say Eclipse is like Linux, NetBean and IntelliJ are like Windows . 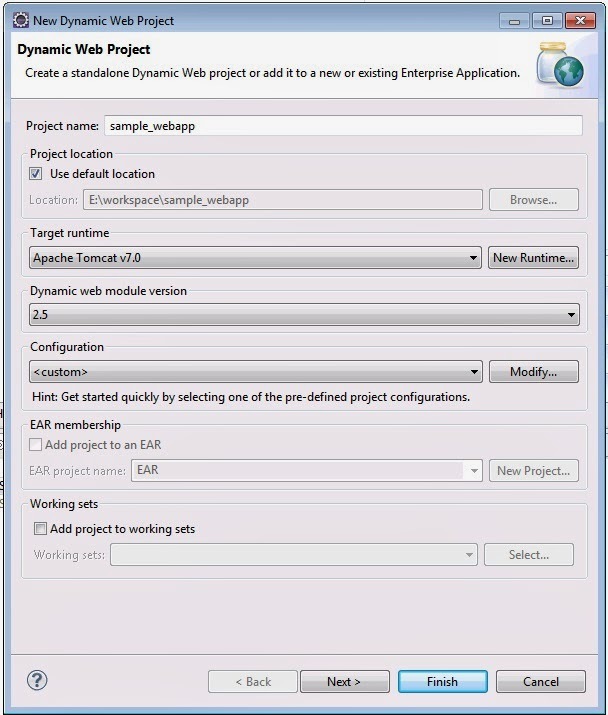 Eclipse is developed by community, difficult to configure but very customizable. 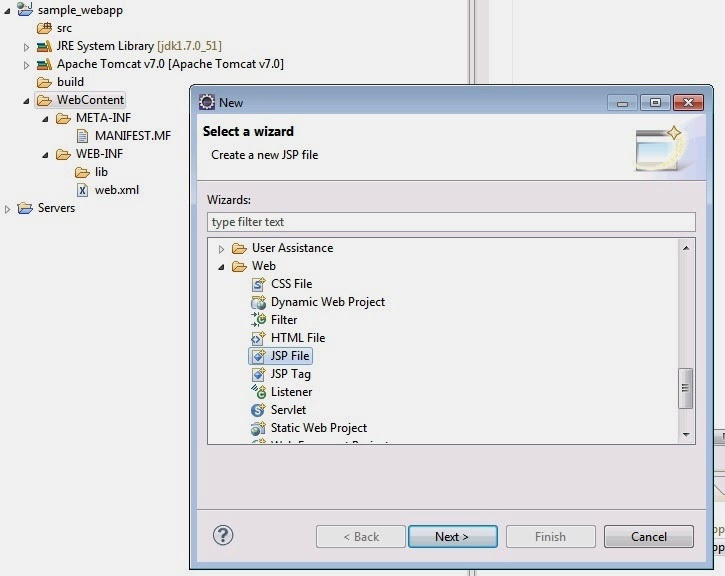 This tutorial will use Eclipse as the default IDE. Create folder "java/workspace". Start Eclipse, it will ask for workspace folder. Please point to the folder we just created. Many of the popular tools and applications need JAVA_HOME to find out JRE or JDK to launch Java process. This practice is preferred over calling java from command line so that it is possible to have JRE available at system path for general use and JDK is for development. In case you need to use different version of JDK for different process, setting JAVA_HOME for each console is easier than modifying system path. Can take a look at mvn.bat or mvn in "java/apache-maven-3.2.1/bin" folder. Maven use the JDK/JRE as specified by JAVA_HOME. Open Eclipse, let navigate to Help -> About Eclipse -> Installation Detail -> Configuration. Verify that your memory configuration in the earlier step really take effect. In the last part of this Caching series, I would like to discuss Virtual DB, the technique we use to build effective caching for database. 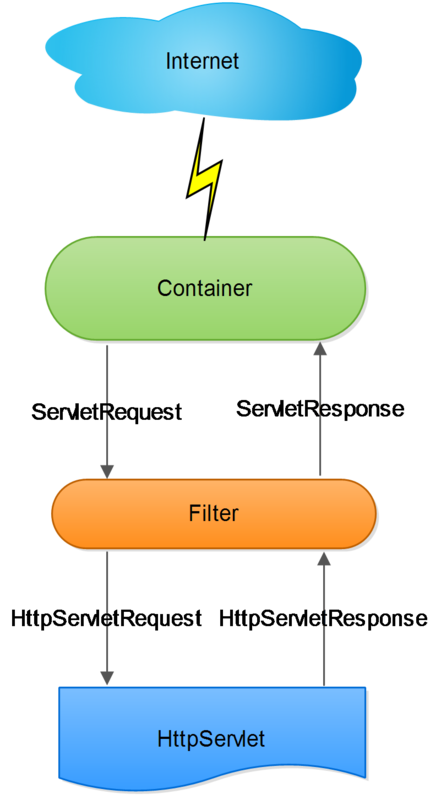 Caching on Database tier share most of common attributes with Caching on business logic tier. 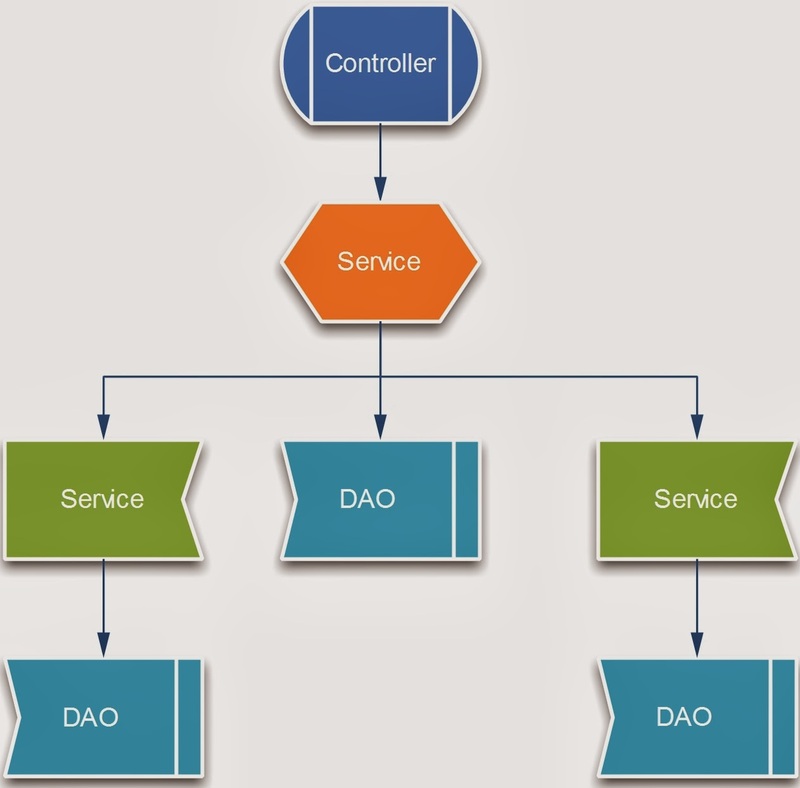 In deed, if you treat DAO as one service, most of the techniques from earlier article can be applied. 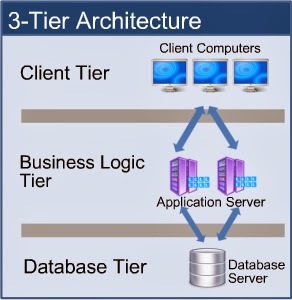 However, due to one unique characteristic of relational database, caching on database tier has one special technique that only can be applied on this tier. This is Virtual DB. Imagine if we have a reporting table that contains the lowest and highest temperature for every day from beginning of this century. The system we build must allow user to enter start date, end date and provide lowest and highest temperature for that period. With the requirement above, active caching is unrealistic due to huge volume of possible queries. Passive caching is also ineffective unless due to some reasons, users keep querying the same period. The table size is small as we only have 14 years from beginning of this century and for each day, we only need to store 2 temperatures. It is the combination of data that explode the caching size. Moreover, the data store in the cache is highly repetitive. For example, if we already store lowest temperature of year 2012 and year 2013, the lowest temperature of from 2012 to 2013 should be known automatically without accessing DB. 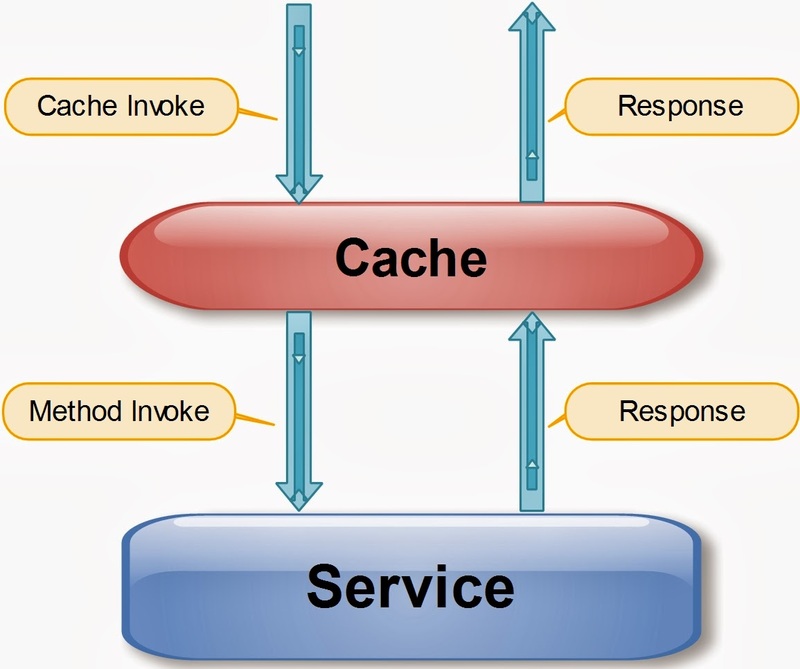 Due to this, it is wise to build the data model inside caching engine and apply business logic to minimize the cache size. I simply call it Virtual DB as it function as a minimized database in memory. It is not realistic to store the whole DB in memory because database is built for scalability, caching do not need this, we only need performance. Because of different goals, we only need to store most frequent accessed records in Virtual DB. It is the developer responsibility to decide which query can be run on Virtual DB and which one is not. Go back to earlier example, daily temperature do not change after being recorded; hence, it is safe to store these data to Virtual DB without worrying of frequently refreshing data. Still, developer can do polling to update the Virtual DB if there is new record. The polling should be smart enough to only fetch additional records rather than fully load the whole table. It is not necessary to build the full data model. The real DB can contain humidity, whether there was storm or rain in that day but we can strip off not interested data. It is also not necessary to store all the data. We can choose to include only the daily temperatures for the last 3 years if observation confirm that most of queries fall within this period. The goal is to replace majority of queries not all possible queries. 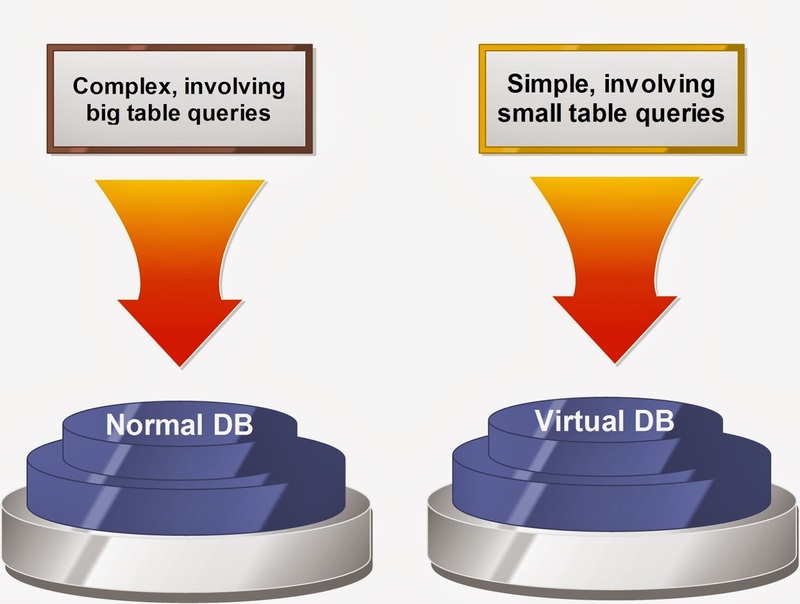 As can be shown the from diagram below, there are queries to both normal DB and Virtual DB. How to build Virtual DB? To build Virtual DB, choose a database system that can use memory as storage. For Java, the most well-known one is HSQLDB. If the systems crash and restarts, simply rebuild the DB as part of webapp starting process. It is a bit complex as we need to maintain 2 data sources in DAO and selectively choose which data source to run the query. Kindly notice that Virtual DB is different from DB Replication. DB replication builds mirrors of DB. To simplify implementation, most of DB replication use master/slave model where the data is one-way synchronized from master to slave nodes. DB replication offer scalability but in term of performance, it is far slower than Virtual DB. Virtual DB even do not need to send request to Database, responses are generated within system memory. The queries to Virtual DB can be hundreds of times faster than querying real DB. Therefore, if you manage to replace 80% of DB queries with Virtual DB queries, it will provide system a huge boost of performance. We have once improved the server load from few hundred requests per second to above 2000 requests per second using this technique. Virtual DB can be used together with other techniques to improve performance. Of the system that we built that suffered the worst DDOS attack in 2011, both DB replica and Virtual DB are used. Generally, we do not like to mix the frequently write with frequently read data. No locking is better than both pessimistic and optimistic locking. So far, we have walked through several well-known techniques to build caching. It is easy to learn the concept but not so easy to implement it properly in real life situation. Developer may need some practices and good understanding of business requirement to build effective caching. Caching is better to be done with some investigation and analysis. In the future, I will provides some more articles about scalability and Load Analysis. We will need to use them to aid Caching design.